Summit County offers a variety of scenic places to live. A very popular location here is Dillon, Colorado. It’s a beautiful region because part of the town is right by the lake. You can find this quaint community between I-70 and Keystone on Highway 6, which is about 93 miles west of the Denver International Airport. It is also 79 miles west of Denver. 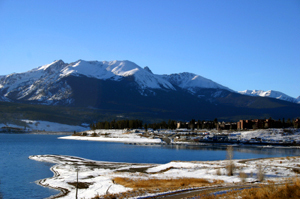 Living along Lake Dillon means you have access to the water while never missing out on all the shops and restaurants nearby. With dramatic mountains in the distance, the Lake Dillon community offers boating, sailing, walking, fishing and picnicking for everyone. The 26 miles of shoreline also provides a wealth of activities, especially during the warmer months of the year. Once winter comes to a close, you can count on lots of free concerts, farmers markets and lakefront events as the temperature rises. It’s well worth waiting for spring and summer when there is so much excitement to look forward to along Lake Dillon. The Dillon Marina has lots of great things to do as well. You can visit the Tiki Bar, experience pontoon boating, go out sailing or rent any kind of water craft for some quality time on the lake. Although this region is best known for its summer fun, ski and snowboard resorts are easily reachable from the winter peacefulness of Dillon, too. Many snow riders think of this town as a great place to stay after being on the mountain all day. If your dream is to live by the water with a beautiful view of the mountainside, Lake Dillon is the perfect place to settle down. You can bask in the sights and sounds of nature while also enjoying a wonderful home that’s not far from shopping and other amenities. Additionally, as a local community Dillon has more affordable homes than some of the surrounding ski resorts. And the types of houses available for sale cover a wide variety of styles. From condos to single family homes, there are houses to fit any taste imaginable. Now that you know more about what makes Lake Dillon so appealing, let me show you some properties that meet your specifications. As a realtor who is very familiar with the listings in Summit County, I can give you a detailed tour of a bunch of wonderful Dillon homes to choose from. You can always reach me by calling our office or sending me an email. Either way, you can be sure to get a speedy response. I’m here to help and I take great pride in searching for just the right house to suit each client’s needs. So contact me today and let’s get started finding you a home in lovely Dillon, Colorado!